WHEN CAN THESE CREDITS BE ADDED? 1. When the six credits corresponding to this kind of activities have been gained. 2. When students meet the requirements to finish their degree that academic year or wish to transfer their academic record to another centre or degree (fewer than six credits may be added in this case). These credits can be added even if the degree's maximum credit number is exceeded. Once added, it will not be possible to remove or replace them. These credits will be included in the academic record with the mark "APTO" (Pass). HOW CAN THESE CREDITS BE REQUESTED? UACLOUD > ACADEMIC RECORD > VIEW > MY RECORDS > SPECIALISATION COURSES > INFORMATION SHEET. Note: The Polytechnic School's university foundation courses for which optional credits can be acquired are only those taken in the 2015-2016 and 2016-2017 academic years. 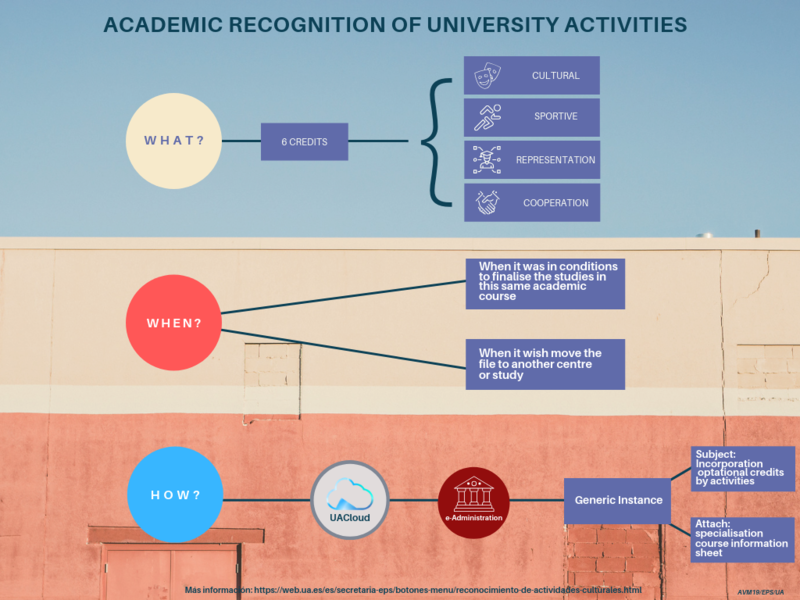 2) If the activity to be recognised is not on the student's UACloud profile, an original and a copy of the corresponding activity CERTIFICATE must be provided at the secretary's office.